I am often asked: can you have a dog at an engagement session? Pet portraits are not a genre I typically photograph, however I certainly do love incorporating pets into another type of photography, such as family portraiture or engagement sessions! To so many people, their dogs ARE their children. Engagements, and weddings, are not only about the engaged couple, but also about their family as a unit. For so many people (myself included! ), their family is simply not complete without their puppy dog. 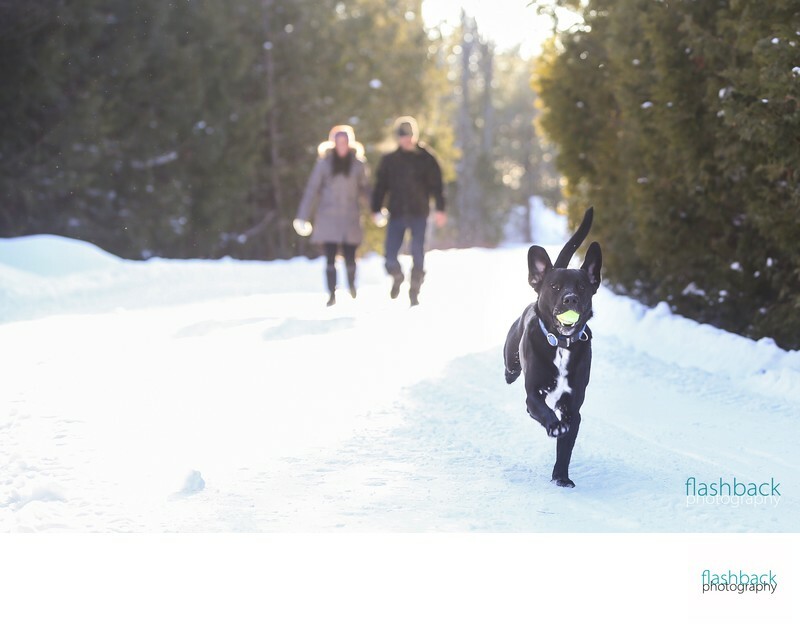 As an engagement photographer in Lindsay, Ontario, working with dogs during an engagement session can be challenging. Some dogs are easily excited by a stranger (me, the photographer) and will not respond to their owners in the same way as they would in a less distracting environment. This can lead to fits of laughter as puppy jumps for joy the moment I snap a picture of the family. In this sweet moment, the couple had just thrown the ball for their happy-go-lucky labrador retriever, and she eagerly raced toward me, hoping I would be next to play the game! Whenever including a pet in an engagement session, I do recommend having a third person to help manage the dog when he/she is not required for photographs. This allows the engaged couple to have their pictures in the spotlight, too! Of course, Fido probably won't enjoy being out of the portrait, and will join in again soon thereafter!